From July 20 – July 22, 2016, transfer students admitted to the UC San Diego Jacobs School of Engineering for Fall 2016 took part in Transfer PrEP, a three day orientation event designed to aid students in the transition from community college. "Transfer PrEp features three days of activities designed to foster a sense of community and support, prepare incoming students academically for the rigor of engineering studies, build awareness of relevant campus programs and resources and connect transfer engineering students to industry and professional networks," said Shane Moise, Student Life Coordinator at the IDEA Student Center who ran the event. On July 12, Fudan University and the University of California San Diego held their first joint Workshop on Nanomaterials and Nanoengineering. The event featured a full day of presentations on cutting edge nano research from UC San Diego, Fudan University and other leading research institutions in China. “We would like to enhance the collaboration between UC San Diego and Fudan in the areas of science and engineering. 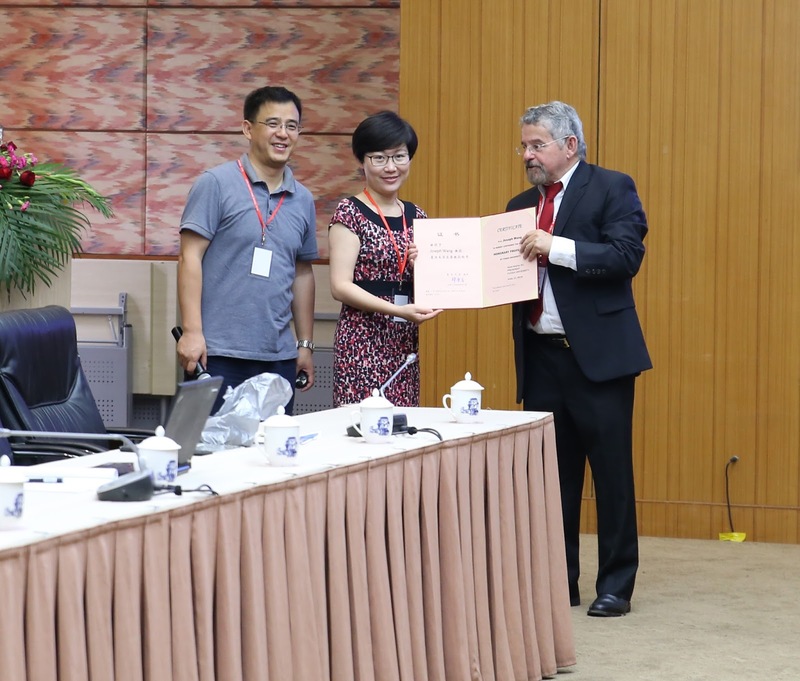 This workshop will help bring on more exchanges of ideas and activities between both universities,” said Yongfeng Mei, professor of materials chemistry and physics at Fudan University and co-organizer of the event. Mei is already working with UC San Diego researchers on projects focusing on metamaterials and micro and nanomotors. “In an effort towards future collaborations, we’re building a bridge between the leading materials program in China and the only nanoengineering department in the United States,” said Joseph Wang, distinguished professor and chair of the Department of NanoEngineering at the Jacobs School of Engineering at UC San Diego, who co-organized the event with Mei. The joint workshop was held to honor Wang in his appointment as Honorary Professor of Fudan University. He received the honorary professorship in recognition of his pioneering contributions in nanoscience, nanomachines and nanobiotechnology. On behalf of Fudan University, Professor Yongfeng Mei (left) and Ms. Ann Wenqing Tang, Associate Dean of International Relations (center) present Professor Joseph Wang (right) with an Honorary Professor Award. 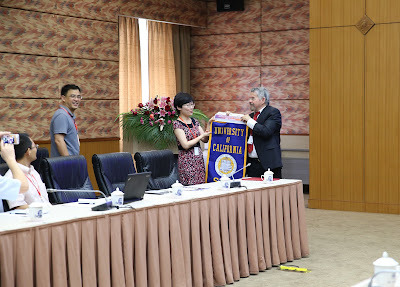 Joseph Wang (right) presents a UC San Diego banner to Fudan University. At the workshop, Wang presented his lab’s work on nanomachines for medical, military, security and environmental applications. Examples include the first demonstration of nanomachines in living animals, nanomachines for cleaning up carbon dioxide pollution in water and microcannons that could fire drug-filled nanobullets at disease targets. Description: The assembly of membrane proteins and membrane-associated proteins triggers various fundamental biological processes including cell uptake, signal transduction and inter-cellular communication. DNA nanotechnology, which enables precise control on the nanometer scale, is an alternative way to unravel such mechanisms. Chen’s lab used membrane-assisted assembly of DNA 2-D array nanostructures to mimic the pattern produced by assembly of triskelion. The successful construction of such membrane structures was confirmed by atomic force microscopy imaging. Description: Liu’s group developed high speed super resolution microscopy for various biological applications. His team demonstrated a new super resolution technique that achieves 50 nanometer wide field imaging at real movie speed. Description: Zhang reported on the biological functionalization of polymeric nanoparticles with a layer of membrane coating derived from natural red blood cells (RBCs). This approach aims to camouflage the nanoparticle surface with the erythrocyte exterior for long circulation while retaining the applicability of the cores that support the RBC membrane shell. In vivo results revealed superior pharmacokinetics and biodistribution by the RBC-mimicking nanoparticles compared to control particles coated with the state-of-the-art synthetic stealth materials. Three types of exciting applications of this biomimetic nanoparticle system were discussed: drug delivery, systemic detoxification and toxin vaccination. UC San Diego held its first annual Center for Visual Computing Retreat May 20-21, 2016. Faculty members of the Center reviewed the work that has been done since it’s opening in 2015. The Center was created to find innovative solutions in computer vision and computer graphics. The retreat included 50+ participants, including 19 visitors from nine industrial sponsors. At the retreat, Ravi Ramamoorthi, Director of the Center and Ronald L. Graham professor in the Computer Science and Engineering Department, and Jacobs School of Engineering Dean Albert P. Pisano gave opening remarks and introduced the Center. The majority of the first day consisted of student presentations on past and ongoing work, as well as a poster session in the evening. Computer science and engineering professor Henrik Wann Jensen also spoke on the challenges presented by light transport simulation. Following more student presentations on Day 2, Ramamoorthi, professor of computer science Jurgen Schulze and cognitive science professor Zhuowen Tu served on a panel featuring a discussion about 3D and VR imaging. The retreat concluded with feedback from sponsors, including Cubic, which posted a blog post about the event. A group of students from the Jacobs School of Engineering at the University of California San Diego will spend the summer trying to curb the HIV epidemic in Tijuana, Mexico. Two teams from UC San Diego’s Engineering World Health (EWH) student organization and Global TIES program are combining forces this summer to bring a device they created to monitor viral load in HIV patients to a clinical setting in Tijuana, Mexico for testing. The teams were tasked with building a low-cost HIV monitoring device for a hospital in Mozambique. UC San Diego Health doctors Matt Strain and Davey Smith are advising both of the teams. To establish when the virus has become resistant, the patient’s viral load or the amount of virus present in the blood, must be assessed. Viral load test equipment costs roughly $80,000, and $65 per test. The students from the Global TIES Open Viral Load (OVL) Team and EWH have each developed prototype viral load testing devices that cost under $2,000. The projected cost per test is $5. The two teams are combining forces to take their completed devices to a clinic in Tijuana, Mexico for testing, with the help of their advisors. “We’ll adopt the best components from each team’s design and incorporate them into a system that’s ready for field implementation,” said Maker. The teams have won over $31,000 in funding this year, including the Open Viral Load and Engineering World Health systems winning first and second place respectively in the Big Ideas at Berkeley Global Health track and receiving $2,000 each from the UCSD Social Innovation Fund. The key is determining the viral load, or the copies of HIV present in the body. After a certain threshold, or above a certain number of copies, the virus is determined to be resistant to HIV therapy, and patients must start new therapies. However, in low resource settings and without the necessary equipment, changing therapies is nearly impossible for doctors to justify. The OVL and EWH teams are approaching the problem differently. In EWH’s case, the device consists of a low-cost centrifuge, PCR thermocycler, and a gel electrophoresis box. The centrifuge, part of the Open Viral Load HIV-Monitoring device, processes blood. The difference between EWH’s device and the device the Global TIES team has built is the output. Hayley Chong and Kirk Hutchison are part of the OVL Team. Chong is a third year bioengineering major. “I chose Global TIES as a freshman because every student I met that was in the program was passionate about their project,” said Chong. Hutchison, a second year biology major, chose to participate in Global TIES after hearing a talk by a Global TIES member at an event. “Global TIES is the reason I came to UC San Diego,” said Hutchison. The two joined the OVL Team at the same time, after taking the introductory course in the Global TIES program. The device is also advantageous because its components can be used separately to identify other diseases. Students will also be working with Dr. Davey Smith this summer to adapt the device as a rapid response test for the Zika virus. Over the course of the summer, groups of students from the two teams now look to clinically validate the designs and begin field implementation. Lab testing will continue under Drs. Strain and Smith here in the U.S. and with their new partner Dr. Jose Roman Chavez Mendez at the Universidad Autónoma de Baja California (UABC) in Tijuana. With the teams collaborating and working together this summer, the future looks bright as they look to make an impact on the first of many low-resource settings.